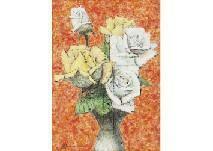 Find artworks, auction results, sale prices and pictures of Jofu Uchida at auctions worldwide. 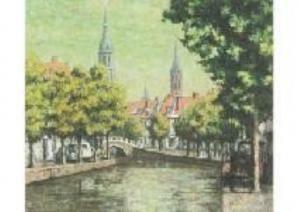 Delft landscape UCHIDA Jofu (a set of 7) oil on canvas, F10 (53x45.5cm), signed, titled on the stretcher, with a sticker of Gallery Umeda, this lot accompanies other works of oil; 【Morning Port on Island (Cozumel, Mexico)】(P8 (45.5x33.4cm))【Port on Southern island (Caribbean Sea, Mexico)】(P8 (45.5x33.4cm), with a sticker of Gallery Umeda)【Seashore with Sailboat (Acapulco, Mexico)】(P8 (45.5x33.4cm))【Boats (Caribbean Sea, Mexico)】(P8 (45.5x33.4cm))【Blue Canal (Caribbean Sea, Mexico)】(F6 (41x31.9cm), with a sticker of Gallery Umeda)【Koyao Highland (Andes, Peru)】(P6 (41x27.3cm), with a sticker of TOKYO GALLERY), all signed, all titled on the stretcher, all framed. White and yellow Roses UCHIDA Jofu (a set of 4) oil on canvas, F4 (33.4x24.3cm), signed, titled on the stretcher, this lot accompanies other works; KITAMURA Tanezo Shionomisaki Cape Lighthouse (oil on canvas, 49.5x64.8cm, also signed and titled on the stretcher) HARADA Katsumi Rose (oil on canvas, F10 (53x45.5cm), also signed and titled on verso) KASUKABE Hiroshi Shinjuku Gyoen National Garden (1959, oil and charcoal on board, 27.4x34.7cm, also signed, titled and dated inside the frame), all signed, all framed. 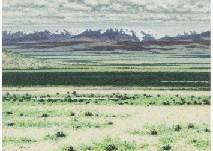 The distant view of Cordillera Real (Andes, Bolivia) UCHIDA Jofu oil on canvas, P40 (100x72.8cm), signed, titled on the stretcher, framed. 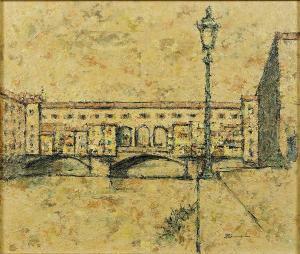 Jofu Uchida (Japanese, 20th Century) Ponte Vecchio. Sight: 17.5" x 20.5" Frame: 21.5" x 24.5"
Jofu Uchida (Japanese, b. 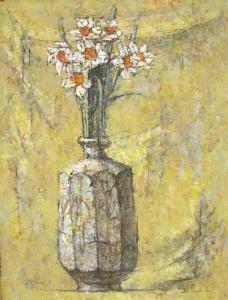 1921), oil on canvas, narcissi in vase, signed LR, framed, ss: 19 1/2" w. x 25 1/2" h.